What are GMOs? Are GMOs safe? Why do farmers grow GMO crops? We know there are a lot of questions regarding GMOs, Genetically Modified Organisms. Let’s start with the basics. 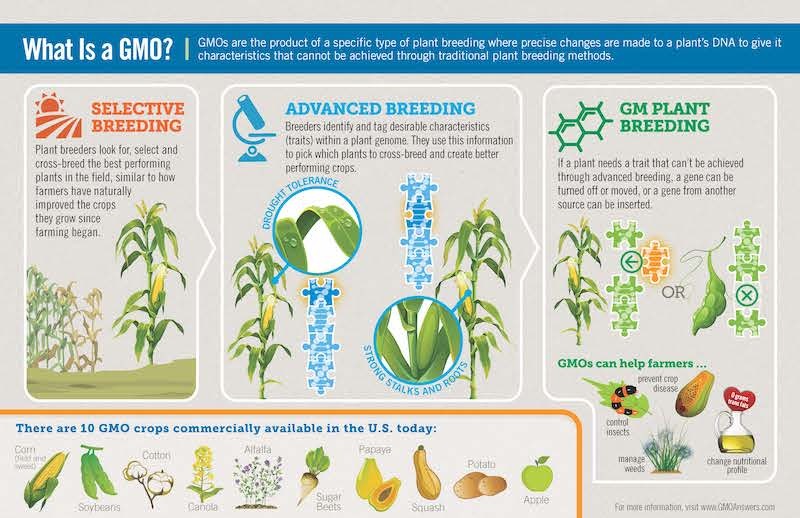 When people refer to genetically modified organisms - GMOs - they are referring to crops developed through genetic engineering, a more precise method of plant breeding. Genetic engineering, also referred to as biotechnology, allows plant breeders to take a desirable trait found in nature and transfer it from one plant or organism to the plant they want to improve, as well as make a change to an existing trait in a plant they are developing. Some examples of desirable traits commonly transferred include resistance to insects and disease and tolerance to herbicides that allow farmers to better control weeds. The 10 genetically modified crops available today include: alfalfa, apples, canola, corn (field and sweet), cotton, papaya, potatoes, soybeans, squash and sugar beets. Have more questions about GMOs? Ask us!